Chôriki Sentai Ohranger Vs Kakuranger (1996) - Sci-fi-central.com. Japan  1996  45m   Directed by: Shohei Tôjô.  Starring: Masaru Shishindo, Kunio Masaoka, Masashi Goda, Ayumi Asô, Tamao Satô, Hisashi Sakai, Hiroshi Miyauchi, Teruaki Ogawa, Satomi Hirose, Shun Kawai, Hiroshi Tsuchida, Kane Kosugi, Shinobu Adachi.. 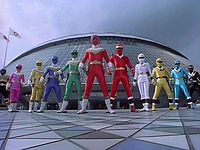 The movie version of Chôriki Sentai Ohranger, directed by Kobayashi Yoshiaki and written by Shōzō Uehara. It premiered in Japan on April 15, 1995 at the Toei Super Hero Fair '95. It was originally shown as a triple feature alongside Mechanical Violator Hakaider and the feature film version of Juukou B-Fighter. 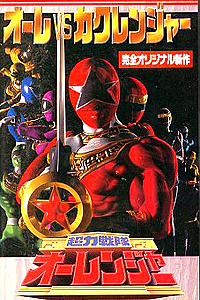 *** This review may contain spoilers *** In Power Rangers Zeo, there was a 2-part episode titled Rangers Of Two Worlds. 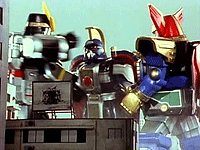 The episode featured the Zeo Rangers teaming up with the Alien Rangers to stop King Mondo and his machines. In my later years, as I discovered Sentai, I wondered what was cut out of the episode. It seemed that there wasn't too much left out, which led to a little bit of disappointment. Unlike its succeeding team-up movies, this one doesn't use the mecha from the previous series. Only the Ohranger mecha are seen. The movie plays like an episode of Ohranger, opening and closing as such with very little special treatment given. Kakuranger doesn't even show up until the second half of the movie. Strangely enough, they're the only ones who get a true henshin sequence in the movie. Still, it was cool seeing what was cut out and what was changed, specifically the nature of the odd pink monster. Still, for something that hadn't been attempted since Goranger vs. JAKQ in the early days of Sentai, this was pretty good. Check it out if you're a Sentai or a Power Rangers fan. Review by Chris (cjpdigi90@msn.com) from United States from the Internet Movie Database.